Below is a step-by-step guide for creating the raster pyramid ready to be used in Earthlight. 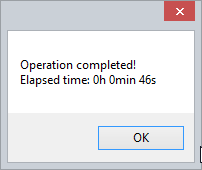 Please execute RasterLoader.exe to run StatMap Raster Loader tool. SMRaster – you should select this type if your source files contain values (not colours). For instance: height data. If your files contains only images (without additional values) – you should use SMPyramid type. SMPyramid – this method creates layers much faster than SMRaster type, however it has some limitations. You should use this method if you want to create a layer which will contain images only (without additional values). When SMPyramid type is selected Number of CPU threads to use option is unlocked. Number of CPU threads to use option (available only for SMPyramid type) allows you to set how many CPU threads should be used to build the pyramid. The more CPU threads are selected – the less time is needed to build a pyramid. Raster Loader allows to select up to ALL -1 CPU threads. This happens because at least one thread is required by the operation system and the remaining processes to work correctly. Select or create a raster layer. Add or remove raster layers. Click Add… and select all files from the folder containing your imagery. [To select multiple files hold Control (to select individual files) or Shift key (to select a range of files). Alternatively you can press Control + A to select all files in the Open dialog.]. Please note that geolocalization files are not displayed on the images list, however they must be placed next to the image files and the file names must match. Click OPEN to load the selected files to Raster Loader. You will see a list of all selected files. 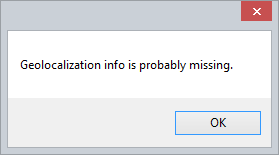 If Raster Loader detects that at least one of the selected files has incorrect (or missing) geolocalization info the following information window is displayed. You can scroll through the file list to find which file has incorrect (or missing) geolocalization info. Set the tile output format. You have two options here: lossless PNG for scanned vector maps (Raster) and lossy JPG for aerial imagery. The quality edit box set to 90 is enough for majority of uses. 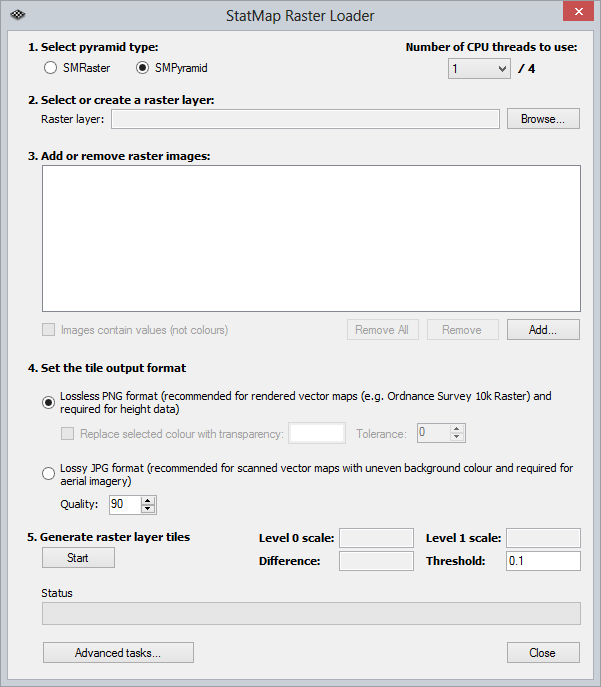 Each raster dataset created by Raster Loader is built of different number of scale levels (the amount of scale levels depends on provided images) which allow to correctly display the images at different scale levels in Earthlight. Scale of the original image files is always used as a level 0. Creating new levels is a time and resource (disc space, memory, CPU) consuming process. In some cases the difference between level 0 and level 1 is very small (for instance: level 0= 1:3780 and level 1= 1:4096). That’s why Raster Loader allows you to decide if level 1 should be created (it consumes the highest ammount of resources). If Difference value is smaller than Threshold value (see below) – Raster Loader suggests to skip level 1. You can control this setting by simply changing the Threshold value. Once you are happy with all the choices press Start to execute raster tiles creation process (this may take a while depending on the amount of data). Once this process ends and you get the confirmation from Raster Loader (see below) you can import the created layer into Earthlight using From Existing Table tool from Administration tab. To create references for raster images in Earthlight please use From Existing Table tool (administration tab). As you can see in the screenshot below, in the left pane you can select one or more table to reference (raster tables are located in Raster Repository and their names end with .SMRaster). 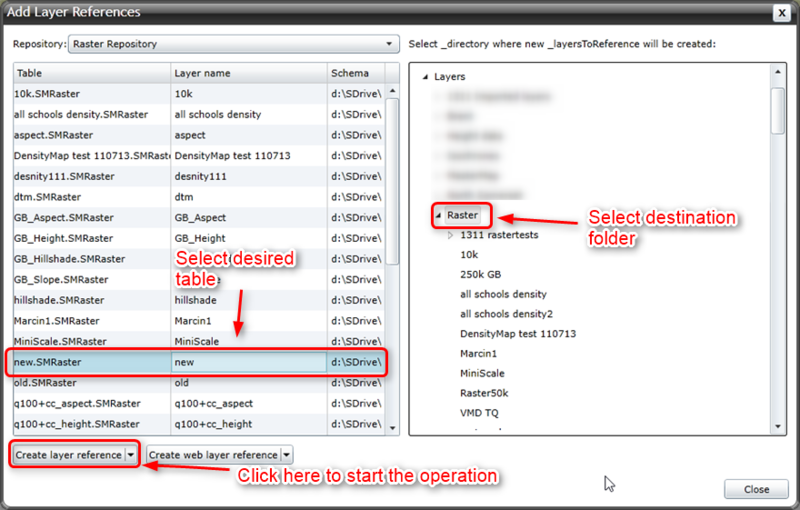 In the right pane you have to select a directory where you wish your selected layer to be created. Next press the Create reference button under the left pane to create the reference.